In more than one way Paso is a town of true grit, it always has been. Famed outlaw Jesse James briefly found refuge in Paso Robles before making a hasty getaway when the law caught up with him. Merchants hocked Paso Robles as the home of California’s finest natural hot springs and mud baths which, for a time, made the tiny Central Coast town a destination for tourists the Country over. So there should be no surprise that Paso winemakers know a thing or two about marketing and selling their wine while still doing whatever the hell they want. It’s in their blood. I love Paso for these reasons, but I fear for its future as well. While it definitely ain’t no Napa, city folks are starting to come to town with their faux castles and garish structures in search of the fantasy of wine. Alongside the brilliant, there is the mediocre and worse. The limo full of drunken thirty-somethings and the generic “we make what people want” producers all exist here. As the praise for Paso rises, the corporate vultures are picking up the scent and are starting to descend like so many black nightmares. And so it begins, wine into bottled water. Still, there are the true voices whose rebel call beckons the true believers, those who know in their soul of souls that great American terroir does exist and that true grit is alive and well in Paso Robles. 2009 Tablas Creek Antithesis Chardonnay – One of the wildest terroir driven Chardonnays we have ever had. This is not your average Chard in anyway. 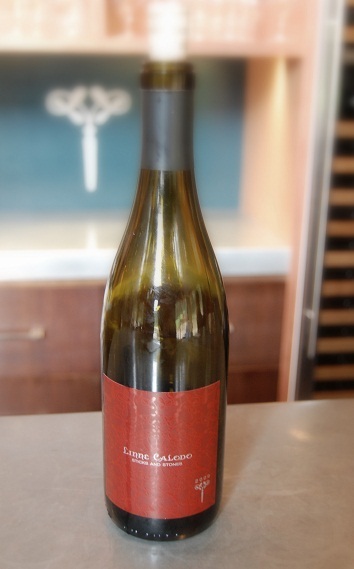 Linne Calodo was a standout experience from our recent travels to Paso. The winery is stunning and the wines powerful and intriguing. I get a bit fatigued trying to keep up with all of the debate regarding alcohol and such, and while I do think many wines have been way over done, I don’t think high alcohol equals bad wine. There is a whole camp of people not thrilled about the Matt Trevisans of the world and yet another camp that can’t wait to get more. Who is right? Who cares?! We drink across the board and because much of our personal collection is on the lower side of things it is a lot of fun to taste through a portfolio of wines that are each crafted to be standouts on their own. Call us young, call us sheep being led to the slaughter, but Matt’s approach to wine grabs our attention in a way that most producers do not. It may not be fair, but it’s the truth. Roussanne and 12% Viognier. 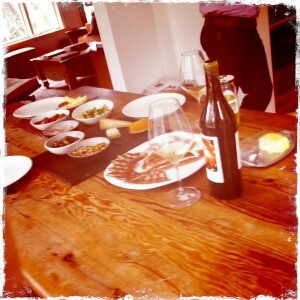 We had several good whites from Paso in April, but my other top choices were Tablas Creek. Since Tablas won in March and I love Sanguis, I stand by my choice. Matthias Pippig has been producing some beastly and haunting wines largely from the shadows. But the light is starting to cut through as critics like Steve Heimoff and others have fallen for these uniquely opulent but balanced blends. They are concoctions in the most flattering sense of the word, “no repeats, no formulas” as Pippig would say. We shared this bottle with the winemaker himself over a lunch of mixed cheeses and meats and we marveled over it’s ripe flavors, aromas, and its alluring balance. Although not easy to find, it is well worth seeking out. OK Paso, back to you. So with no surprise, we were impressed with Linne Calodo,particularly the 2009 Rising Tides, a blend of 40% Mourvèdre , 30% Syrah, and 30% Grenache. I don’t know why theses kinds of wines grab us the way they do, but there is no denying their allure. Call us superficial, but we think a good bottle of wine should of course taste good, but deliver something we can’t get elsewhere. With Linnie Calodo, we get a name behind the bottle; Matt Trevisan, who is so connected to the wines he crafts that his winery is his home. Like Sanguis, Linne Calodo is a deeply personal project from a deeply passionate craftsman making wines of structure, style, and true grit. Next month, on to the wines of Monterey, or whatever we feel like.